I find that inspiration for new dishes comes from a multitude of sources: childhood memories, fantastic restaurant meals, conversation with friends, bizarre dreams (yes, it’s true – I do dream about cooking from time to time), etc. But I think the most often used source of inspiration comes from the plethora of cooking and travel shows with which I seem to fill my television-viewing time. The local PBS station has added an additional HD channel to its line-up called Create. It’s full of familiar PBS programs that show you how to build, garden, paint, sew, travel, and cook. The travel hosts are these intrepid globe trekkers hopping from country to country, showing us not only the history, art, and architecture of each place, but also the unique cuisine of the region (always makes me alternate from cringing to salivating as I see what they eat). One recent afternoon, sandwiched between trips to London and Paris, was a repeat of America’s Test Kitchen, which was tackling Mexican food. Don and I both stopped in our tracks as we watched them work their magic on chicken tacos. They came up with a preparation that I knew I needed to steal pay homage to in a recipe. I know there are all sorts of theories about not serving dairy products with seafood, so I left it off for the glamour shots, but I certainly loaded the jack cheese and sour cream onto my taco before I ate it. I also had some fresh ears of corn in the fridge that needed a reason to be cooked. I always think lime pairs well with corn, so I decided to roast the corn along with some scallions and created a simple Lime Corn Salad to go with the shrimp tacos. The chipotle gives a smoky punch to the shrimp. The natural sweetness that comes out of roasting corn complemented the tacos brilliantly. (I have to say, being a Hoosier boy, there’s nothing like fresh corn you pick up at an Indiana roadside stand, but I am certainly developing a fondness for fresh Florida corn as well. I think it’s a little sweeter, but Indiana corn has more depth of flavor). And with the obvious lime flavor running through the meal, an ice-cold Corona is the only thing that made sense. Just like the right wine selection, it enhanced the flavors and pulled the meal together. Regardless of where the inspiration came from, I’m just glad that this new dish is around. Don is already hitting me up to make it again. That’s always a good sign. A quick and simple twist to seafood tacos that makes it perfect for a weeknight meal. Add butter, garlic, chipotle and adobo. Sauté until fragrant, about 2 minutes. Add lime juice and 3 T chopped parsley. Bring to a simmer. Add shrimp, cover, and simmer for 3 to 4 minutes, until shrimp are opaque, but not quite cooked through. Reduce remaining liquid by two-thirds, until thick. Return shrimp to pan and add remaining 1 T of chopped parsley. Stir until shrimp are coated with sauce. 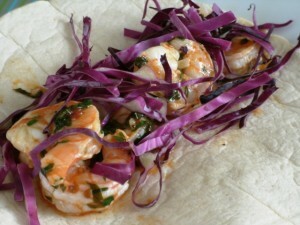 Warm flour tortillas and add ¼ of shrimp mixture to each tortilla and top with shredded cabbage. Add sour cream and cheese, if desired. This entry was posted in Cooking and tagged easy, inexpensive, mexican, quick, seafood, shrimp, tacos. Bookmark the permalink.